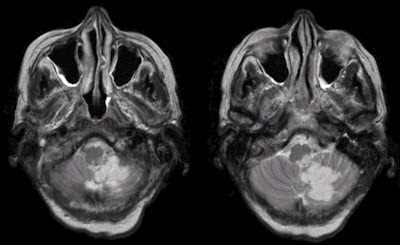 MRI axial FLAIR images of Brain show an infarct involving left frontal lobe anterior to sylvian fissure. Area of involvement corresponds to left MCA Superior Division territory. The internal carotid artery (ICA) terminates in middle cerebral artery (MCA) and anterior cerebral artery (ACA). The MCA main stem runs laterally towards Sylvian fissure, giving off the lenticulostriate vessels. The lenticulostriate vessels are the small perforators supply the basal ganglia. The MCA main stem then bifurcates into superior and inferior divisions. The superior division supplies the lateral frontal and superior parietal lobes, whereas the inferior division predominantly supplies the lateral temporal and inferior parietal lobes. The superior division of the MCA is one of the most common locations for embolic stroke, either from carotids or from heart. MCA superior division territory infarctions typically result in a contralateral hemiparesis affecting the lower face and upper extremity more than the leg; similar distribution contralateral hemisensory loss; contralateral visual field deficit predominantly affecting the lower fields; and often a gaze preference to the ipsilateral side. Dominant hemisphere infarct is often associated expressive aphasia where as non-dominant infarct is associated with neglect syndrome. MRI axial Flair image of brain shows an infarct involving the left temporal lobe below the Sylvian fissure. Area of involvement corresponds to left MCA Inferior Division territory. CT study of brain shows an infarct involving the left temporal lobe below the Sylvian fissure. Area of involvement corresponds to left MCA Inferior Division territory. The inferior division of the MCA is less commonly affected by emboli than the superior division because the superior division is larger and carries more blood compared to inferior division and hence, it is statistically more likely for emboli to travel there. Inferior division territory infarct do NOT cause any weakness or sensory loss. They are typically associated with contralateral visual field deficit predominantly affecting the upper fields i.e. "pie in the sky" deficit . Dominant hemisphere infarct is often an associated receptive i.e. Wernicke's aphasia where as non-dominant hemisphere infarct is associated with behavioral disturbance and impairment of visuospatial skills like drawing, copying, dressing and often misdiagnosed initially with primary psychiatric disorder. CT study of Brain shows an infarct involving involving right peri sylvian cerebral cortex and adjacent insular cortex. Right basal ganglion is spared. Area of involvement corresponds to right MCA distal main stem (superior as well as inferior division) territory. Distal Stem Middle Cerebral Artery (MCA) Infarction involve the distribution of both, superior as well as inferior division of the middle cerebral artery with sparing of basal ganglia, results when an embolus blocks the MCA distal main stem after the take-off of the lenticulostriate vessels which supply basal ganglia. Distal MCA stem occlusion infarct result in contralateral hemiplegia affecting the lower face and arm more than the leg, similar distribution contralateral hemisensory loss and a contralateral visual field deficit. Dominant hemisphere infarct often associated with global aphasia that is expressive and receptive where as non-dominant hemisphere infarct is characterized by neglect syndrome and impairment of visuospatial skills like drawing, copying, dressing. CT study of Brain shows an infarct involving involving left peri sylvian cerebral cortex, adjacent insular cortex and left basal ganglia. Area of involvement corresponds to left MCA proximal main stem (superior division, inferior division as well as lenticulostriate ) territory. Proximal Stem Middle Cerebral Artery infarct involves deeper basal ganglia in addition. The involvement of the basal ganglia denotes that the block has occurred at the proximal middle cerebral artery, before the take off of lenticulo striate perforators that supply basal ganglia. Occlusion of the proximal main stem of the MCA affect the superior division, inferior division as well as the lenticulostriate perforators. Proximal MCA territory infarct result in a contralateral hemiplegia, contralateral hemisensory loss and a contralateral visual field deficit. Dominant hemisphere involvement result in an associated global aphasia where as non-dominant hemispheric infarct is associated with a neglect syndrome.The major clinical difference between a proximal and distal MCA stem occlusion is that with a proximal lesion the leg is plegic as well. This occurs because the lenticulostriates are involved, which results in infarction of the internal capsule, which contains fibers to the leg, arm and face. CT study of Brain shows bilateral MCA proximal main stem terriotry infarct. MRI Axial FLAIR images of brain shows an infarct involving left pre central cortex - a left MCA cortical branch occlusion infarct. A single MCA branch infarction is nearly always secondary to an embolus. 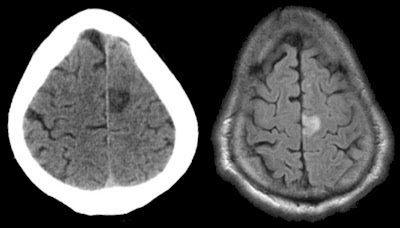 CT images of brain shows an infarct involving right frontal pre central cortex - a right MCA cortical branch occlusion infarct. MRI Axial FLAIR images of Brain shows multiple cortical branch occlusion infarcts. Unlike multiple cardiac emboli that typically affect multiple vascular distributions, here multiple infarcts are in the same vascular territory i.e. ICA - MCA. CT study of brain shows infarct involving right para sagittal frontal lobe. Area of involvement corresponds to right ACA territory. CT study of brain shows infarct involving left para sagittal frontal lobe. Area of involvement corresponds to left ACA territory. CT and MRI Axial FLAIR Brain shows a focal infarct involving left medial frontal lobe. The infarct is caused by a branch occlusion of the left anterior cerebral artery. As the anterior cerebral artery supplies the medial frontal lobe, an infarct in this distribution predominantly results in weakness of the contralateral leg. Axial CT study of Brain shows a sub acute ischemic infarct in the distribution of the left middle cerebral artery (MCA) and anterior cerebral artery (ACA). This type of infarction occurs when the clot is located at the top of the carotid artery and there is no collateral flow from the contralateral side through Acom. Occlusions of the distal ICA affect both the superior and inferior divisions of the MCA, as well as the lenticulostriates, resulting in a contralateral hemiplegia (face, arm and leg); contralateral hemisensory loss; a contralateral visual field deficit, and often a gaze preference to the ipsilateral side. With an infarct in the dominant hemisphere, there is often an associated global aphasia (expressive and receptive); with a non-dominant infarct, there is often a neglect syndrome and impairment of visuospatial skills (e.g., drawing, copying, dressing). CT study of brain shows an infarct involving left occipital lobe. Area of involvement corresponds to left PCA territory. PCA territory infarct is most often caused by a cardiac embolus or an embolus from an occluded or stenotic proximal vertebral or basilar artery. The basilar artery bifurcates into right and left PCAs at its termination, which then course around the midbrain in the ambient and quadrigeminal cisterns to supply the medial / inferior temporal lobe and the medial occipital lobe. Small perforators arise from the proximal PCAs, which supply the cerebral peduncle as well as the thalamus (the latter known as thalamoperforators). Infarctions in the territory of the PCA most often result in a contralateral hemianopsia. Other signs and symptoms depend on whether the infarction involves the thalamoperforator territory. Proximal PCA involvement results in coexistent infarction of the lateral thalamus, with contralateral hemisensory findings. Infarction of either PCA may result in impaired memory (verbal on the left; spatial on the right). In addition, left PCA lesions are sometimes associated with alexia without agraphia (patients can write, but cannot read what they have written); transcortical sensory aphasia (a receptive aphasia similar to Wernicke's aphasia except that repetition is relatively spared); and Gerstmann's syndrome (a combination of acalculia, finger agnosia, agraphia, and right/left confusion). With right sided PCA lesions, patients may have a visual neglect. They may also have prosopagnosia, an inability to recognize familiar faces. 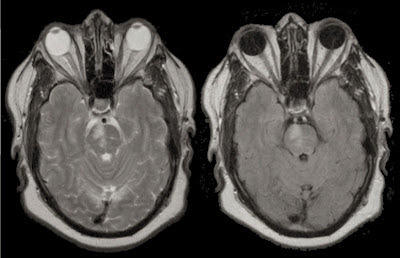 MRI Axial FLAIR images of Brain shows infarct involving right thalamus, right medial occipital and medial temporal lobe. Area of involvement corresponds to right proximal PCA territory. Proximal PCA territory infarct show an associated infarction in the thalamus result with an embolus to the proximal posterior cerebral artery as small perforating arteries to the thalamus arise from the proximal posterior cerebral artery. The basilar artery bifurcates into two PCAs at its termination, which then course around the midbrain in the ambient and quadrigeminal cisterns to supply the medial / inferior temporal lobe and the medial occipital lobe. Small perforators arise from the proximal PCAs, which supply the cerebral peduncle as well as the thalamus (the latter known as thalamoperforators). Infarctions in the territory of the PCA most often result in a contralateral hemianopsia. Other signs and symptoms depend on whether the infarction involves the thalamoperforator territory, and whether the infarction is left vs. right sided. Proximal PCA involvement results in coexistent infarction of the lateral thalamus, with contralateral hemisensory findings. 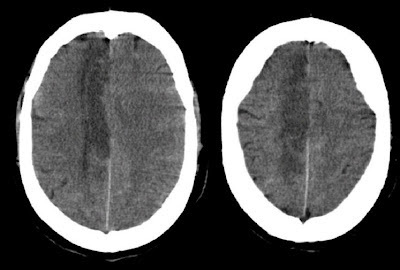 Infarction of either PCA may result in impaired memory (verbal on the left; spatial on the right). In addition, left PCA lesions are sometimes associated with alexia without agraphia (patients can write, but cannot read what they have written); transcortical sensory aphasia (a receptive aphasia similar to Wernicke's aphasia except that repetition is relatively spared); and Gerstmann's syndrome (a combination of acalculia, finger agnosia, agraphia, and right/left confusion). With right sided PCA lesions, patients may have a visual neglect. They may also have prosopagnosia, an inability to recognize familiar faces. 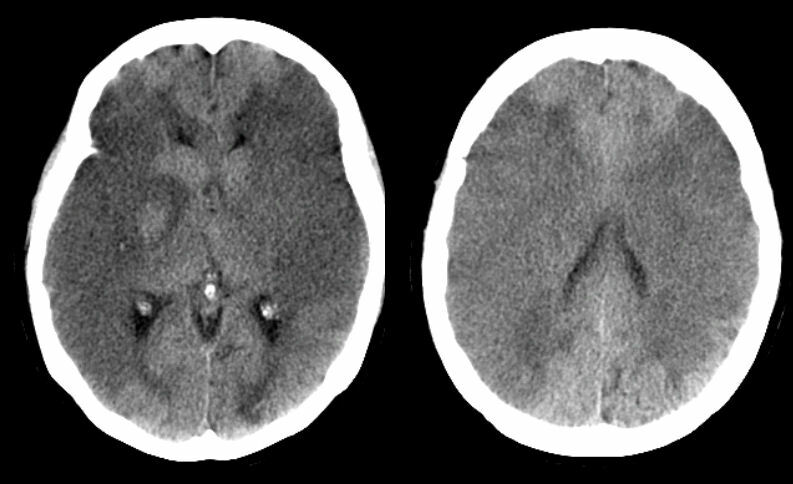 Axial CT study of brain shows an infarct in the distribution of the left middle cerebral (MCA) and posterior cerebral (PCA) arteries, such infarct possible with Fetal PCA. Simultaneous infarction in the distribution of MCA and PCA arteries can occur from multiple emboli which is possible but un common; It is more likely that a single occlusion caused this lesion. A number of individuals have a normal anatomic variant known as a persistent fetal circulation, wherein the PCA arises directly from the posterior communicating artery off the internal carotid artery. In this case, an embolus at the top of the internal carotid artery can then infarct the middle cerebral and posterior cerebral artery territories. In this case, the anterior cerebral artery territory is spared, presumably because of an intact anterior communicating artery whereby blood can flow from the contra lateral side. 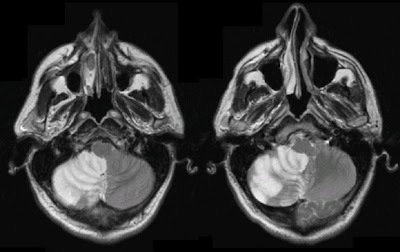 MRI Axial Diffusion Brain shows infarcts with restricted diffusion involving fronto parietal and parietal cortex on either side. Area of involvement corresponds to ACA - MCA watershed (cortical border zone) anteriorly and MCA - PCA watershed (cortical border zone) posteriorly. The area between two vascular territories is known as a watershed (border zone). Watershed infarcts typically occur following reduced perfusion pressure, often secondary to cardiac events or severe bleeding and they are often bilateral. When a watershed infarct is seen unilaterally is due to hemodynamic narrowing of a proximal artery. A hemodynamically significant ICA stenosis, ischemia first occurs along the border zone between the ACA - MCA or MCA - PCA territory on that side. The anterior watershed territory between ACA - MCA corresponds to the shoulder and hip girdle muscles on the motor homunculus, leading to a characteristic clinical deficit, weakness of the shoulder and hip girdle muscles bilaterally often referred to as "the man in the barrel" distribution of weakness. The posterior watershed territory infarct between the MCA - PCA result in bilateral cortical visual abnormalities, among them cortical blindness, Anton's syndrome that is cortical blindness with denial/confabulation and Balint's syndrome that is asimultagnosia, optic ataxia, and gaze apraxia. A deep watershed area exists between lenticulostriates below and the cortical branches above characterized by an infarct in basal ganglia and adjacent corona radiata or para ventricular white matter. CT study of brain shows an infarct involving left basal ganglia along deep border zone. MRI Axial Flair Brain shows a lacunar infarct in the region of the posterior limb of the right internal capsule. Lacunar infarct also known as small occlusion infarct, caused by occlusion of the deep perforators, most commonly associated with hypertension and diabetes. 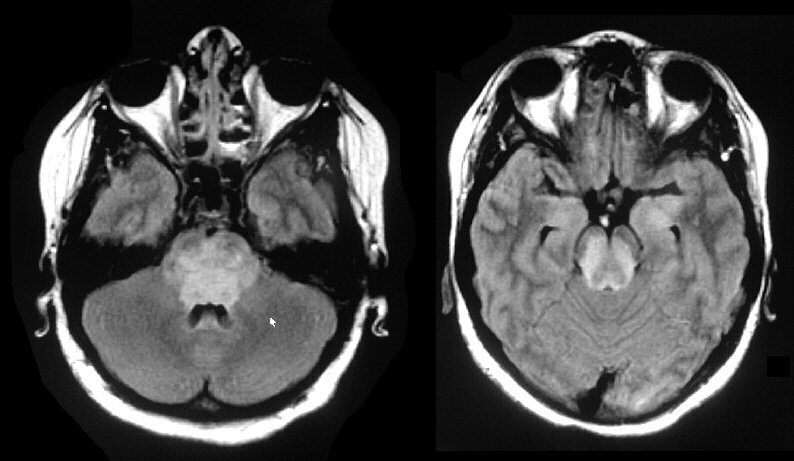 Classic lacunar syndromes include pure motor hemiparesis, ataxic hemiparesis, clumsy hand-dysarthria characterized by lesions either in the internal capsule or basis pontis and pure sensory loss caused by a lesion in thalamus. Remember that lacunar strokes are NOT associated with cortical findings such as aphasia, apraxia, neglect or visual field abnormalities. MRI Axial Flair images of brain show multiple lacunar infarcts in bilateral peri ventricular white matter. Multi lacunar state also known as Binswanger's disease often results in a subcortical dementia characterized by memory loss, altered mood and cognition dysfunction along with focal motor and sensory changes. Usually have chronic hypertension and / or diabetes. Other prominent features of the disease include urinary incontinence, a slow unstable gait, tremors, clumsiness, behavioral and personality changes, lack of facial expression and speech difficulties. Medial medullary infarction result in classic "crossed" neurological syndrome characterized by an ipsilateral hypoglossal nerve palsy with a contralateral hemiparesis. The medial medulla is typically supplied by a branch of the anterior spinal artery which arises from the vertebral arteries. 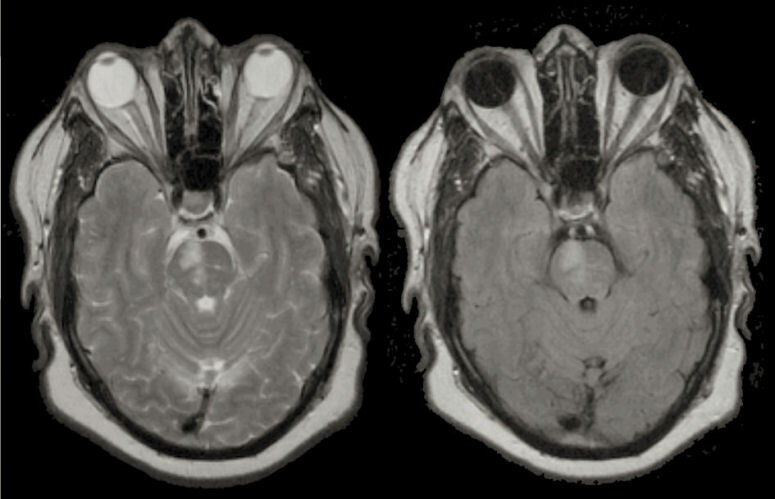 MRI Axial Flair Brain shows an infarct in lateral portion of right half of Medulla. 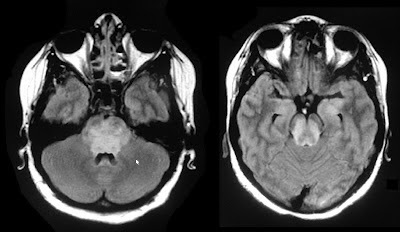 Lateral medullary infarction result from occlusion of the vertebral artery or PICA results in a Wallenberg's syndrome characterized by nausea, vomiting, and vertigo along with ipsilateral facial numbness, weakness of the ipsilateral soft palate, ipsilateral ataxia, and contralateral numbness of the body. An ipsilateral Horner's syndrome (ptosis, miosis, anhidrosis) may be present. MRI Axial FLAIR Brain shows an infarct involving caudal portion of right cerebellar hemisphere. Area of involvement corresponds to posterior inferior cerebellar artery (PICA) territory. MRI Axial FLAIR Brain shows a left Lateral Medullary and Inferior Cerebellar Infarction. Area of involvement corresponds to the posterior inferior cerebellar artery (PICA). PICA territory infarct result in a Wallenberg's syndrome characterized by nausea, vomiting, and vertigo, ipsilateral facial numbness, weakness of the ipsilateral soft palate, ipsilateral ataxia, contralateral numbness of the body and ipsilateral Horner's syndrome (ptosis, miosis, anhidrosis). MRI Axial FLAIR Brain shows an infarct in right half of mid brain, a recent infarct with restricted diffusion. Area of involement corresponds to the distribution of one perforating branch of the basilar artery. 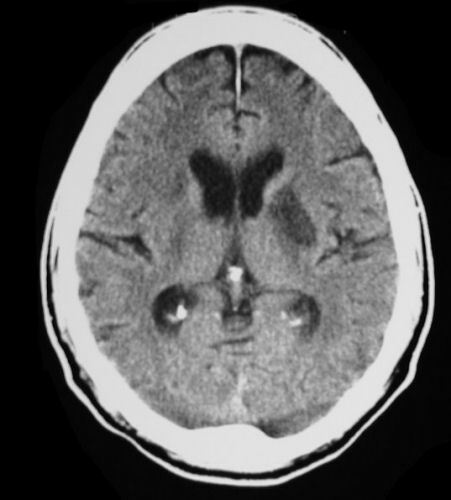 These lesions are usually caused by the occlusion of one paramedian basilar branch seen with aging, diabetes and hypertensives. Occasionally associated with intrinsic disease of the basilar or an embolus to the basilar. Clinically present with Weber's syndrome characterized by a classic "crossed" neurology syndrome of an ipsilateral 3rd nerve palsy and a contralateral hemiparesis. 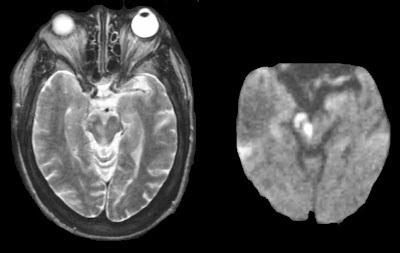 MRI Axial FLAIR Brain shows an in right half of Pons, area of involvement corresponds to one perforating branch of the basilar artery. The lesion is usually caused by the occlusion of one of perforating branch from basilar seen with aging, diabetes and hypertensives. MRI Axial FLAIR brain shows an infarct involving entire pons and midbrain, corresponds to the territory of the main basilar artery. Basilar territory infarct result from either intrinsic basilar artery disease or an embolus to the basilar artery. The cerebellum is spared presumably due to collateral flow from PICA, AICA and SCA. MRI axial Diffusion shows involving caudal portion of right cerebellar hemisphere in right PICA territory and left medial occipital lobe in Posterior Cerebral Artery territory consistent with an embolus to the posterior circulation territories. Reference : My most favorite "Neuroimaging in Neurology by David C Preston, MD, Professor of Neurology and Barbara E Shapiro, MD, PhD, Associate Professor of Neurology"
This is an excellent reference. Thanks for the effort.